Richie Porte has made up plenty of ground after thr stage three time trial. 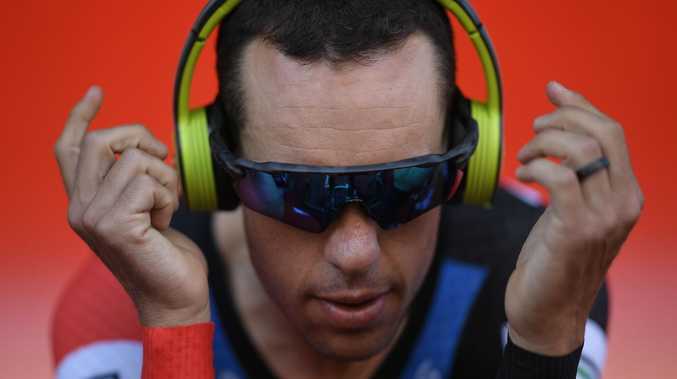 RICHIE Porte has roared back to life at the Tour de France after BMC flexed their team time trial muscle in a Stage 3 blast around Cholet. Porte and his seven teammates, assembled with this day in mind, flew around the 35.5km circuit at an average speed of 52km/h to record an unbeatable time of 38min46sec. Team Sky was four seconds back in second place, while Quick-Step Floors pipped Mitchelton Scott for third at seven seconds off the pace. The date - and result - was certainly symbolic for the Aussie star as it marked exactly 12 months since Porte sensationally crashed out of the 2017 race on Stage Nine. BMC's powerful performance wiped Porte's unlucky Stage 1 setback off the map. The 33-year-old had gone into the race against the clock alongside Chris Froome and Adam Yates at 51 seconds down on every other title rival, including Rigoberto Uran, Romain Bardet, Vincenzo Nibali and Mikel Landa. But by the time the sun had set on day three, only Dumoulin and Uran had survived Porte's spectacular counter strike. BMC's scorching performance, in which they reached a max speed of 90km/h, catapulted Porte to 14th on general classification. He also leads Froome by four seconds. Chris Froome and Sky couldn’t match it with BMC. Picture: AP. "After what happened on the first stage, throwing 51 seconds away just from a silly little crash, today to take back time ... on some of the other GC guys is great," Porte said. "The guys today were really impressive. It's hard to pinpoint one, but when you have guys like Stefan Kung it makes it a little easier. "Today was not really my thing. It was more up to the big guys, so I did shorter turns and got out of the way." The win put Porte's teammate Greg Van Avermaet into the yellow jersey. Team Sky had set the early pace after nudging Mitchelton Scott off the podium's top step, but were quickly topped by BMC. French hope Romain Bardet again suffered a time trial implosion, with his AG2R La Mondiale squad shipping 1min15sec. Bahrain-Merida's performance (+1min6sec) also hurt Nibali. Movistar's struggles compounded leader Nairo Quintana's poor start to the Tour. The Colombian is now more than two minutes down overall after a bike problem on the opening day put him on the back foot. Stage 4 takes the peloton back into road stage mode, with another flat 195km run from La Baule to Sarzeau set to create tension at the finish. It is a change of scene that will see Porte go back into preservation mode. "Obviously it's really just about staying out of trouble," Porte said. "Yesterday (Stage 2) we put the team towards the front and obviously you burn energy doing that, but I think that's just the way you have to ride at this Tour. "Tomorrow is a little more straight forward, but Stage 5 is really hard. It's another tricky stage." With sprinters wanting their time in the sun and the GC riders desperate not to lose any time, a flat first nine days has become a minefield. "We storm like crazy bulls on a town," Dumoulin said. "Everyone can move from behind at any time. That is scary though. If it is narrow and there are turns, you can't do that."